The Annual Educational Homeschool Evaluation required by Florida law can be stress free and simple for everyone in your family, especially for YOU! We will do our best to make sure of it. Email us: CCTucker7@gmail.com with any questions. NO TEST is required by FL Home Education law. A test is only 1 of 5 options allowed for the Annual Homeschool Evaluation required by FL law. The choice is completly your decision. Our fee for the Annual Educational Homeschool Evaluation done by email (Cyber Evaluation) or U.S. Postal service, is only $28. I am shocked by evaluators charging WAY TOO MUCH: $40 or more! Even up to $60 and $100+, for a simple portfolio review? For a PORTFOLIO Evaluation, $40-100+ or MORE? That's a RIP OFF! My Annual Educational Homeschool Evaluations done in person are only $35 for the 1st student & $30 for each additional student at the same location on that same day. This is to encourage evaluating several families' children at the same location on the same day and can be done anywhere you all feel most comfortable. For example, at the library, your home, the park, a church, a café, etc. A travel fee of 40 cents per mile is added for distances over 10 miles away, unless I am already traveling near your preferred location. I am currently a valid, certified teacher with the Florida state Dept. of Education. My Florida State Dept. of Education certificate expires on June 30, 2021, at which time I will renew it. You will find my FL Dept. of Education certificate # listed as Charles Curtis Tucker. To relieve the confusion and stress of the Annual Homeschool Evaluation is one of our main goals. Our hope is to help you and your family to have more quality time together by doing the annual evaluation for your homeschool students simply and quickly. Also, because many "evaluators" charge way too much for a simple evaluation and want to charge you for answering some simple questions about homeschool requirements, or academic curricula, and call it a "consulting fee," or something like that, we decided to get more involved! Please do not misunderstand. I am not saying all evaluators, county offices and/or "umbrella schools" are not helpful, but some are confusing and/or misleading with regard to homeschool requirements, and FL home educationl law compliance. Some even just refuse to give helpful, honest answers and information. It is our privilege, and honor, to be able to help you all, with the BEST School Choice: Homeschooling! Home Education is the BEST! My wife & I are the first of anyone in our families to homeschool our own children! With both of my parents being teachers, I felt like I was like homeschooled, while still attending public school. Portfolio Reviews, for the Annual Educational Evaluation, are sooooo simple. 1. A teacher selected by the parent shall evaluate the student’s educational progress upon review of the portfolio and discussion with the student. And then the law goes on to give the other 4 choices for annual evaluations, describing types of tests administered by a FL certified teacher, like myself. I also administer standardized tests of many types, though a test is NOT required for the annual educational evaluation for a homeschool student, it is one of the choices. Cyber evaluations make complying with homeschool requirements very economical, fast and simple. Many county offices allow homeschool parents to send the evaluation attached to an email directly to them and they print and file them immediatedly. It is so streamline and easy. You will get copies and documentation of everything instantly. I receive samples of the student's work (portfolio) by email, or via the U.S. Post. I review the student's work samples, and determine if the student is progressing at a level comensurate with his or her ability, as stated in Florida Home Education statute ss.1002.41. Then I complete the evaluation form letter, scan it, and attach the evaluation to an email and send it immediately, and directly to you, and to the county, if you like. Most county homeschool office personnel allow us to email the Annual Educational Evaluation directly to them to be processed and recorded. This makes it sooo simple. I can also mail by regular U.S. Post the evaluation letter to you if you prefer. The Conversation over the phone or via Skype.com is simply a formality. The evaluation is solely based on the grade reports/transcripts or portfolio work samples showing progress comensurate to the students' ability. I use the conversation with the student to encourage the student to practice everything as much as possible and do their best. I ask the homeschooled student a few simple, relaxed questions like: "what is your favorite subject?" "how long have you been homeschooling?" etc. It is very simple, relaxed, stress free and professional. In Person Evaluation An in person evaluation is also very simple, it just takes longer than a cyber evaluation. We agree on a time an place to meet. I meet the parents and students in thier home, the library, or sometimes we have met at the parents favorite casual food establishment. Whatever is preferred by the parents is what I do. Group Discounts Once I travel to a place to do an evaluation, to do several more evaluations at that location is very convenient and economical for everyone. If the distance traveled is more than 10 miles there is a nominal fuel fee of 40 cents per mile over 10 miles. I can evaluate 1 or more children from the same family, as well as groups of children from several families at the same place (such as the library, church or one family's house - wherever you all feel comfortable). In this way families save time & money. Standardized Test Administration I also administer standardized tests such as the Stanford Achievement Test, Iowa Test of basic skills, CTBS, etc... Each of these is a different cost according to the ordering of the particular test. Please call me for details on testing costs and procedures. Like stated above, they are all a little different so it depends on which one you desire most. I am Charles Curtis Tucker. I am a home schooling parent since 1999 and a U.S. certified teacher since 1993 and a Florida certified teacher since 1996. I have been a full-time certified teacher in international schools in South America and Europe, as well as the states of MA, S.C. & FL. I finally resigned from full-time classroom teaching in 2005/06 to focus more on my family, homeschooling, educational workshops, promoting home education, watersports, marine industries, and being a helpful part of our community as much as possible. I am also an approved standardized test administrator. 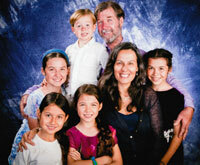 I spent 11 years full time teaching in the classrooms of public and private schools in South America, the U.S.A. and Europe, and I have been homeschooling our children with my very Wonderful wife, MaggiLu, since 1999. I am extremely inspired everyday to promote excellent home education in every way possible. My goals for getting involved in providing annual educational evaluations as a FL certified teacher, and homeschooling parent, are to encourage homeschooling, and make it as stress-free, and as effective and productive as possible. As a FL certified teacher, providing low cost Annual Educational Homeschool Evaluations, and Standardized Testing, is one of the best ways for me to achieve these goals and be a helpful participant in our community. We have lived in Orange Park, FL, Cocoa Beach, FL, Hollywood, FL and Coconut Grove, FL. We have family in Boca Raton, FL, West Palm Beach, FL and St. Petersburg, FL. We travel to various locations throughout Florida monthly, especially the east coast of Florida and through the middle of the state, therefore I am available for annual homeschool evaluations, and administering standardized tests in all counties of FL. Of course I can do a cyber evaluation anytime, for any county in Florida, usually very quickly. I have always been known by my middle name, Curtis, since my dad's first name is also Charles and he is also a professional educator / teacher / professor for more than 30 years, now a retired professor from U.S.C. Once again, the Florida state department of education enabling us to do cyber evaluations has made annual homeschool portfolio evaluations super convenient for everyone.